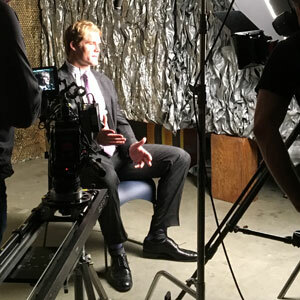 INDIANAPOLIS — Three weeks after his Panthers lost in Super Bowl 50, Greg Olsen has swapped his jersey for a charcoal suit. The mountain-man beard and unkempt look he saw through the 2015 season has also been replaced by a clean shave and gelled hair. Against a backdrop of NFL prospects trying to catch a team’s eye, the All-Pro tight end walks through the bowels of Lucas Oil Stadium with a purposeful stride, intent on acing his own job interview of sorts. The league’s so-called Underwear Olympics provide an annual opportunity to tryout the next crop of players, but the combine has also become a must-attend networking event for nearly 2,000 NFL personnel-types, 1,000 media members, 800 agents, countless marketing representatives and current players thinking about a career beyond the field. At noon, Olsen met with NFL Network talent producer Marcus Smith to get a rundown of the day. First, Olsen will spend an hour in a luxury suite with ESPN analyst Merril Hoge, Colts tight end Dwayne Allen and nearly two dozen fans as part of a meet-and-greet. Then, if he’s amenable, an interview for an upcoming special on his former teammate, Matt Forte. “Oh I’d love to,” Olsen says. 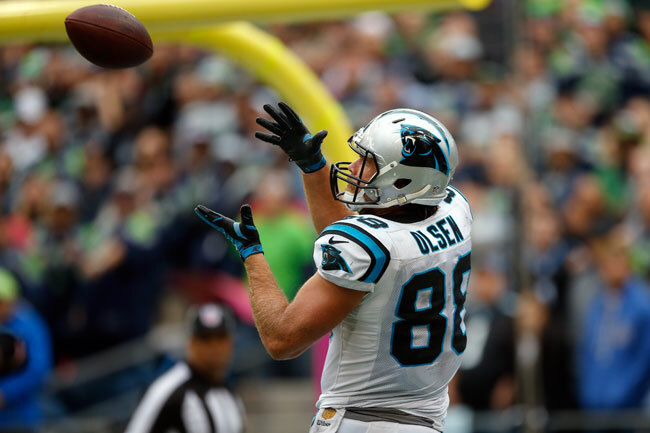 “He’s one of my best friends.” After that, Olsen will go to the field to report during tight end drills and then do a live segment with NFL Network anchors Bucky Brooks and Matt Smith. “Do you guys want me to wear this suit on the field?” he asks. A year later, the Pittsburgh radio station B-94 asked Hoge to call in during the season and do interviews. At the time, he was the first active player to have a regular radio spot. Hoge enjoyed the freedom to explain certain plays in depth and educate fans on how the offense really unfolded. The following year, Hoge was approached by DVE, a competing station that offered him $15,000 a year to be on air. When Hoge signed with Chicago in free agency in 1994, he kept the spot on DVE—and has kept his call-in spot to this day. Olsen isn’t sure if he wants to be a traditional analyst like Hoge, opine like Stephen A. Smith or host a show like Dan Patrick. Two seasons ago, Olsen debated Smith on ESPN’s First Take and defended Cam Newton. Smith argued that Newton’s putting a towel over his head represented defeatism. Olsen countered that Newton puts a towel over his head after interceptions, punts and touchdowns. “That’s his thing,” said Olsen, who thought of himself as a lawyer in that scenario. He had to make his case, support it with evidence, and be more persuasive than his opponent. 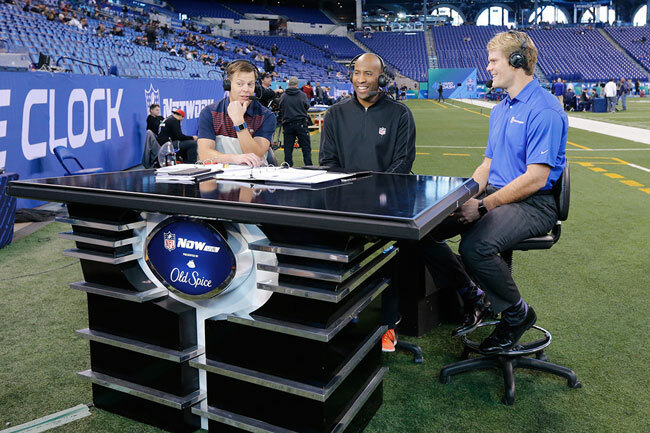 Olsen has a favorite story about his own combine experience in 2007. The New Jersey native interviewed with the Jets, and head coach Eric Mangini introduced him to nearly 30 team employees in the room. When Olsen finally sat down, Mangini pointed to a man in the corner. “What’s that guy’s name?” the coach asked. Olsen ended up correctly identifying just one person. After signing a few autographs, Olsen is off to film the interview about Matt Forte. But first, a pit stop. Olsen pokes his head into the suite where Panthers coach Ron Rivera is evaluating prospects. “Hey, find us some players, why don’t you!” he says. Olsen is then escorted into a storage room that has been turned into a makeshift studio. Even though he wasn’t given much time to prepare, Olsen answers every question about Forte with personal detail and fluidity. “I remember when I first time I saw him at a workout,” Olsen says, “And my first impression: that’s a quiet, humble guy.” The word “um” is absent from Olsen’s vocabulary. “If only every interview was this easy,” a cameraman says as Olsen exits six minutes later. The experience, Olsen says, wasn’t drastically different than speaking to a scrum of reporters after a game.